Looked out the window this morning and jumped in the car to capture the sunrise. This was one of the final and favorite shots of the drive. Photo is SOOC. Beautiful shot! Did you bribe the horses?! No wonder it was one of your favorites. The silhouettes of the two horses take it to a whole new level! What a wonderful capture Kareen! @bradsworld @malc @siwainastromoy Thanks so much! Wow, what an amazing photo. The horses played nice and posed perfectly. The sky is awesome. Very poignant. Love the hues and the silhouette. Title is spot on! FAV and a new follower. You do exquisite work. Just lovely - the subject, comp, light perfect. Wow, fav. Absolutely sweet and gorgeous. @daisyjuds Thanks so much for the fav, Judith. :) Much appreciated. Love this picture a lot! So beautiful! 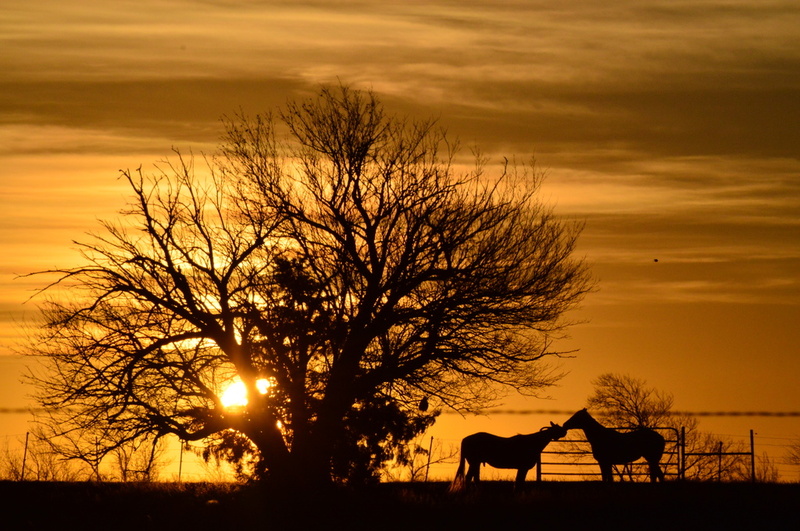 Lovely silhouettes of tree and horses. Wow! Great shot! I love the colors! You so rock these silhouette shots. Fav!!!! @parisouailleurs Thanks so much for the fav, Helene! Very much appreciated!